I love to visit northern Minnesota, specifically along Lake Superior and in the Boundary Waters Canoe Area. Love it. I am so thankful I married a Minnesotan who actually traveled up to this area during his youth. Over the years, I've learned that most Minnesotans go to the lakes in the middle interior, a few may get as far north as Gooseberry Falls, and fewer still have had the amazing pleasure of going into the BWCA. Tis a shame, but also, keeps it a special secret for those in the know, the lush forest, the ocean-like lake, the rocky shores, the rolling hills, the steep cliffs, the dense chain of lakes and forested portages... it truly is an amazing section of country. My first introduction to this area was on our honeymoon. In late November we were married and Josh had kept our honeymoon destination a secret. He told me to pack for hot or cold weather and then, as we loaded up the Rubbermaid tubs in the Lowe's parking lot, he had me flip a coin - heads we go north on I-35, tails we go south on I-35. It landed on heads and we traveled north. 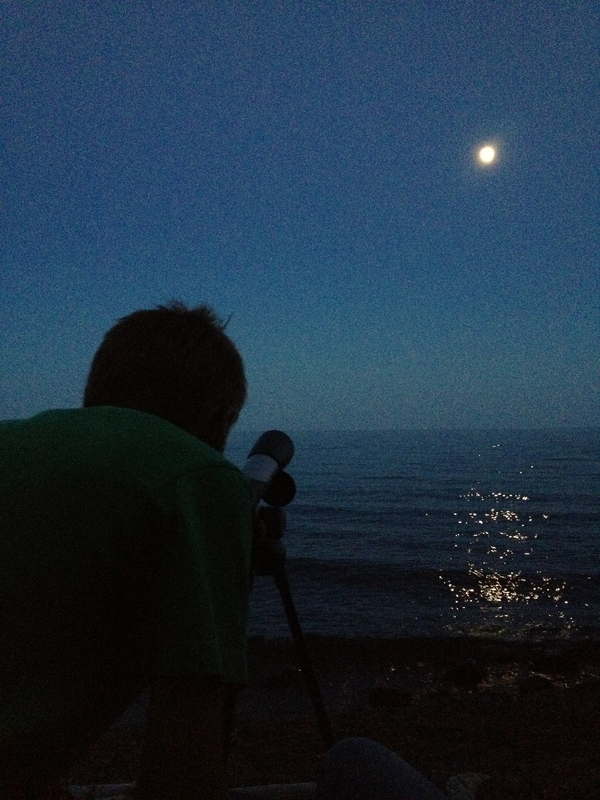 We first stopped in Duluth, where Josh had reservations for the night. Then we traveled further north, stopping at the grocery store in the town of Grand Marais, where Josh told me to buy enough food to last for 4 days. Then we traveled up the Gunflint Trail for another hour, through the dark and the snow, when we finally reached the end of the road, turning into the Gunflint Lodge parking lot. We were then directed to a beautiful, enormous cabin (I mean, huge! With its own hot tub room and sauna rooms!) located right on Gunflint Lake, across from Canada. We were given complimentary champagne and chocolates, and as we thanked God for our safe travels and toasted our arrival and new marriage, Josh revealed to me the rest of his honeymoon secret. There were no plans had the coin landed on tails. He only had made plans, reservations, and deposits for going north. This cabin is normally hundreds of dollars a night but being the "off" season, we got it for a couple hundred dollars TOTAL. What an amazing gift to the start of our marriage! It was 4.75 years later, in 2004, that we were able to make the trip to this beautiful part of the country again. This time it was with our 4 year old, 2 year old, and me 7 months pregnant. Our plan was to drive around Lake Superior, but that was the only thing we had "planned." We had packed our camping gear and the boys in our little RAV 4 and made our way north. We stopped somewhere between Duluth and Grand Marais to camp for our first night. While reminiscing about our honeymoon, and since we had not set schedule or plans, we decided to spend a little more time in the area. 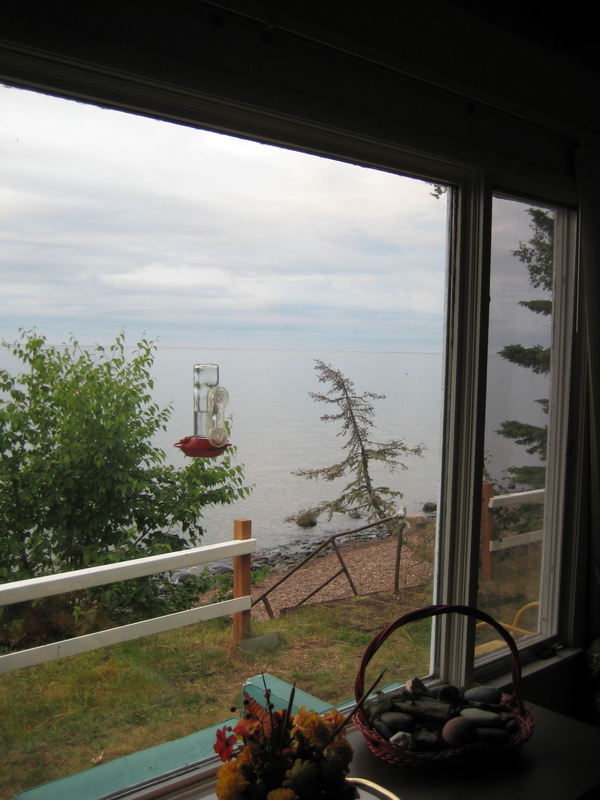 Due to the rain, Josh suggested and somehow found a little cabin a little further north of Grand Marais. We were in love. The tiny cabin was perfect. 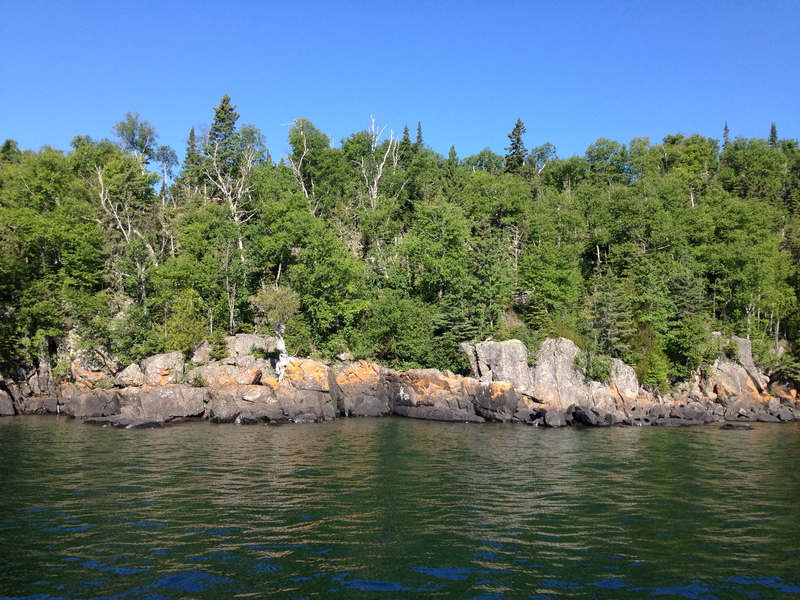 It was located right on Lake Superior, with its own secret trail to the point and endless rocks for the boys to throw. The huge picture window, that took up the entire tiny wall, gave the most beautiful view of the lake. It had exacly and only what you needed, too. It had two bedrooms just big enough for the full beds in them, it had a living/dining room no bigger than the bedroom, it had a kitchen with only enough space for the tiniest appliances, and it had a bathroom no bigger than the refrigerator. Add into that, the radiant heat smelled like my grandmother's house, the furnishings looked like my grandmother's house, and when we checked in the tiny, eldery woman who owned the cabins greeted us in her mu-mu, looking like my grandmother. * We were in love. Like I said, "somehow" Josh found the cabins, because this was back in the day of pre-cellphones with internet (heck, even internet every/anywhere period), and it wouldn't be for another 5 years before I actually found them again. The elderly woman had passed away but the cabins that bore her name remained in the family and were the same adorable dives we dreamt of for years. Since then, we have made it a yearly family trip to this stretch of shore. Sometimes we get to stay in our favorite dive, sometimes a little nicer set of cabins, sometimes by ourselves, sometimes we have shared the secret with family or friends. The beginning of the summer of 2012, we scheduled our trip to the North Shore to correspond with our yearly trip to Josh's dad's cabin. We would get away, just the 5 of us, for 5 nights and then go to his cabin in northwest MN for (what was to be) 4 nights. We headed out on a beautiful summer day and, for variety, decided to make the drive north through Wisconsin to Duluth. Our new route took us through what is called the Driftless Area of Wisconsin. Driftless means that the land was never touched by glaciers making the topography that of forested, rolling hillsides, deep rivers with steep rocky cliff edges, as well as prairies and wetlands. It is beautiful country, marked with an adorable cafe halfway through our journey. While we soaked in our new surroundings, we failed to take any photos but came away from the area with our bellies full of yummy food and a speeding ticket warning for me. It was definitely worth the extra time. We arrived to, what we all five consider, one of our favorite places in the world late that first night. Even though we rushed to the shore upon our arrival, we couldn't wait to fall asleep and wake for a full day. *I know at one point in my blog's history I wrote about my grandmother, but I'll be damned if I can find it. Nevertheless, I think I will write about her again sometime because that woman was amazing and her impact on us, her grandchildren, was life changing. At my cousin's wedding recently, we all recounted Grandma stories with tears in our eyes and a little shakiness in our voices.